I put Ann Charter's Kerouac on the smoker's bench outside Amelia Gayle Gorgas Library on campus. I told the janitor who sweeps up the butts not to bother it. Just let it go. "To Robert, With Love.... October ' 73 Susan" is written on the cover page. Your brother [James Innerarity] has made an admirable acquisition of lands in the vicinity of Matanzas and if the lands interest pays it continues to day but half as well as it has for some years back his success is undoubted. There is besides a very good society of foreigners collecting in that neighborhood which will add to the enjoyment. This is wild. My blog ended up on some girl from Southern California's blog. She posted all this perverted stuff I found on Fidel's early years. Our home backed-up to the woods and was one house away from the corner house. The corner house wasn't on Westview. It was on Anne Street and the side street was a dirt road that went back into the woods. Across the street from our home where other houses that had backyards that sloped down. In fact there was block walls behind their houses and those on Magnolia Street which were even lower. Our home was small with windows that cranked out. The street that I lived on in Ozark was Anne Street. It would be interesting to learn something about the cemetery that was deep in the woods behind my home. Do you have any connections. I went to www.mapquest.com and saw the there was undevelped property behind. Janet Ray Weisinger found out she was living on Anne Street in Ozark when she entered the first grade and her Daddy was recruited by the CIA for the Bay of Pigs Invasion. I received this email from her today. Since people are finally reading this stuff, I guess it's time to say a little about my experience with Cuba over the Internet. This all started in the year 2000 when I actually paid to have an Internet server at our house in Northport, Alabama. Three things immediately happened. Bill Casari, the curator of the FORBES COLLECTION in New York City contacted me about a possible article in FORBES about the Forbes Purchase papers which may still await discovery in Cuba. I also met Rich Chartrand and Ken Kesey over the Web. Rich Chartrand's great-great grandfather owned a plantation in Matanzas Province along the Canimar River near Limonar.The plantation was named Ariande. This was the house where William Rufus King was inaugurated Vice President of the United States. Rich emailed me photos of the Canimar River and the ruins of Ariande. I met Ken Kesey through his website intrepidtrips.com. He wanted to take his bus, Further, to Cuba and I had referred him to some Cuban websites so he wanted me to get him Castro's address so he could write FIDEL a letter requesting permission to bring the bus to Cuba. I gave Ken all I had which was the Cuban Interest Section address in the Swiss Embassy in D. C.
That's a pretty good introduction to my interest in CyberCuba but, of course, it's not the whole story. TIME WILL TELL JUST WHO HAS FELL AND WHO'S BEEN LEFT BEHIND, WHEN YOU GO YOUR WAY AND I GO MINE. Rich Chartrand was in Matanzas a couple of weeks ago and met Professor Carlos Chacon Zalvidar who heads the history department at the University of Matanzas. Rich asked Chacon Zalvidar about the Forbes Purchase law suits that may be archived in Matanzas. The professor didn't know anything about Forbes. Rich is a real resource because of his frequent trips to Matanzas. His great-great grandfather was Colonel John Chartrand who owned the Ariandne Plantation near Limonar in Matanzas on the Canimar River. This was where William Rufus King of Dallas County was inaugurated Vice President of the U.S. in 1853. Rich has emailed me photos of the ruins of Ariandne and of the banks of the Canimar River. Thanks a lot for all the help, Rich. This is the Supreme Court case concerning the Forbes Purchase which may have archives in Cuba. I'm gonna start putting old links back up. This is the Texas A & M site on the Confederate blockade-runner,Denbigh. Don't believe half the stuff on this site,however, it will familiarize you with the Knights of the Golden Circle who helped to organize the Lopez expeditions. This is an excellent de la Cova on the involvement of Jacksonville, Florida Freemasons in the Lopez expeditions. A 1906 appeal filed against the heirs of John Forbes estate by the U.S. In November the Merry Pranksters will be out "on the bus" in full force to do a semi-local tour to promote 2 new books. . . and just have fun!!! Soon to be released by Viking Press will be "Kesey's Jail Journal" by Ken Kesey, and "Spit In The Ocean # 7, All About Kesey." The tour is still unconfirmed, but this is the plan.....We hit Eugene right during the Kesey Symposium then we hit Portland, and hopefully we take the bus all the way to the Bay Area. So keep checking back, I will have more information as it comes. Soon I will be offering advanced orders of these books...probably a limited, signed edition by the Merry Pranksters, as they wrote many of the Kesey stories. Eugene, Thursday Nov. 13, 7:00 pm Tsunami Bookstore, 2585 Willamette St.
Portland, Sunday, Nov. 16, 5:00 pm, Powell's Bookstore, to be held at the Baghdad Theatre across the street from the Powell's store on Hawthorne Ave.
San Francisco, Wed. Nov. 19, 7:00 pm, Booksmith, 1644 Haight St.
... Thursday Nov. 20th, maybe Santa Cruz? Mountain View, CA (just south of Palo Alto), Friday Nov. 21, 7:30 pm, Books Inc. Bookstore, 301 Castro St.
Berkeley, CA, Sat. Nov. 22, Cody's bookstore, 8:00 pm, 2454 Telegraph Ave. The Pranksters, the bus, the books, readings, remembrances, booksignings, a show, a prank or two....and who knows what else will happen? We hope to see you at these event/happenings, please check back for changes in the tour. We will soon be preparing ourselves, our show, and our bus for the festivities. If you are interested in helping at an event, or painting and preparing the bus, please contact me (Zane) at keyz@key-z.com. Found that great stuff you put on the Web and posted it on my blog at "Cuba, Alabama"
bus to Cuba if I knew where to mail it to. I figure anybody who was close to Che couldn't be completely bad. I gave Ken the address of the Cuban Interest Section at the Swiss Embassy in D.C. 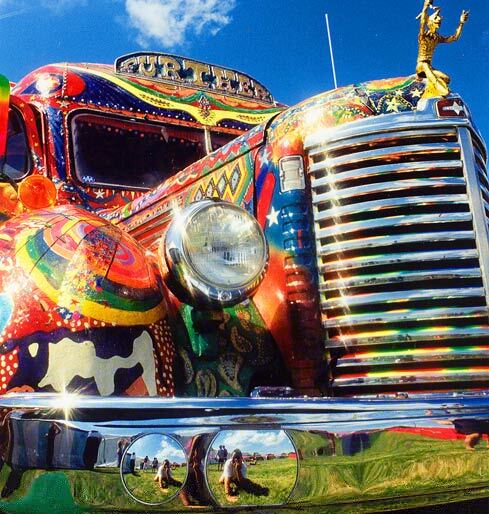 If we could get the Bus over to Cuba, it would fulfill one of Kesey's last wishes. It would fit in nicely on one of those warehouse barges leaving the Port of Mobile for Havana and after a 40 hour voyage to the island, there would be a different vibe in Cuba. Also consider that the Pranksters's bus trip to New York City in ' 64, chronicled in Tom Wolfe's The Electric Kool-Aid Acid Test, came through Mobile and next summer marks the 40th anniversary of that episode. Keep up the good work and let me know what's going on. CONGRATULATIONS TO EVERYONE AT THE UNIVERSITY OF ALABAMA FOR THEIR PREPARATIONS FOR ALABAMA-CUBA WEEK!!!! Monday-Thursday, November 17-20, 2003.Cuba Week Fall 2003 for full details of Alabama-Cuba Week, The University of Alabama, Tuscaloosa, Alabama. A visit to Cuba by a group of University of Alabama deans and faculty to meet with counterparts. For more information contact Dean Carmen Taylor, Associate Dean of the College of Arts & Sciences or Dr. Lawrence A. Clayton, Chair of Cuba Committee, University of Alabama. School of Commerce and Business Administration, Interim Term, led by Professor Chad Hilton traveled to Cuba May 19 - 30. The class was Multinational Business Communication: FocusCuba, IBA 351. The course focused on economics and culture. It was a combination of assigned readings (The Cuban Way and The Cuban Revolution were required), lectures on Cuban economics, the Special Period, social and cultural issues and systems, and site visits both in and outside Havana. Hilton and students will be presenting a "debriefing" at the November, 2003 Alabama-Cuba conference. Various visits by members of the School of Engineering, the Library, and other divisions of the University have occurred between March and August, 2003. Scores of M.A. and B.A. graduates. Lino Gutierrez, M.A., will be sworn in as U. S. Ambassador to Argentina, Sept. 5, 2003. Formerly U. S. Ambassador to Nicaragua. Interest in Cuba dates from several years ago at UA; but the relationship between Cuba and Alabama goes back--literally--almost five hundred years. A special issue of Alabama Heritage in 2004 will be devoted to Alabama and Cuba. However, we need about $45,000 and I'll accept donations, or promises, today. Angus Cooper (and brother David), member of Board of Trustees, donated $50,000 in 2002 to kickstart the Cuba Initiative at UA. Dean's trip to Cuba January, 2003, a promising start to developing a strong Latin American consciousness among leaders at the University. Other than Stan Murphy being robbed, a good week for all! Alabama-Cuba Week, Nov. 17-20, 2003 to focus on the developing academic ties between Alabama and Cuba. A direct result of prior trips and the next step in the developing process. Brief description of topics, including a wide variety of activities, from chemistry to book making, religion to archaeology. Very few, if any, colleges here at UA not represented in this program. Interest in Cuba and Latin America far reaching across the State, including the decade-long sister city relationship between Mobile and La Habana, the UAB medical community (in addition to our own Colleges of Nursing, and Community Health Sciences), and, of course, the commercial and economic ties being fostered by everyone from shippers in Mobile to chicken parts producers across the State. Reconforming the Latin American Studies Program to subsume the Cuba enthusiasm and initiative and give it form. Make this a truly system wide initiative following the Chancellor's lead. Do a national search for a director. Establish a Board of Advisers and/or Supporters, including members from both the academic and business communities. Actively seek outside funding to complement a commitment on part of administration to kick start the Institute. Make this into a truly system-wide, interdisciplinary center for the study of Latin America with The University of Alabama taking the lead, which, it in fact, it already has. We can either move forward on the tremendous energy being shown, or let others step up to the bat.